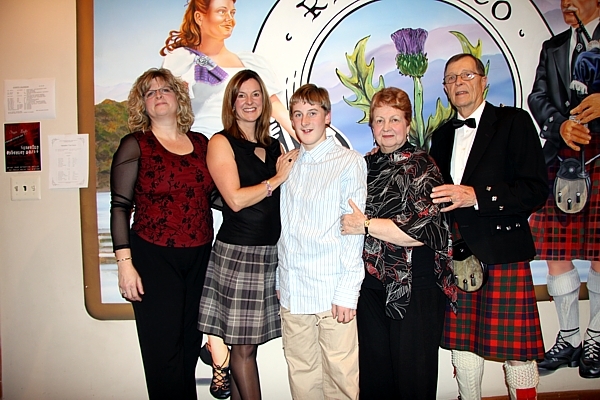 The Hart family has been dedicated to Windsor's Scottish culture for decades. Janet and Ian Hart, for example, have been members of the Scottish Society of Windsor since its 1964 inception; and in 1985, Ian became a founding member of the pipe band's third incarnation. Their daughters, Moira and Marjorie, went on to found one of the premier schools of Highland Dance in the area, and their teenaged grandson, Alec, is following his grandfather on the pipes. Janet Hart's family has been in Canada since the 1840s. Her mother's family was of the Campbell stock that was forced from their crofts during the Highland Clearances. That branch of Campbells settled in the Ridgetown area of Chatham-Kent. Ian's family emigrated Scotland more recently; his father, Jack Hart, was from Airdrie, Lanarkshire, and came to the Detroit area after the First World War to find work. His mother, Jean Findlay, was born in West Calder, near Edinburgh, and came to Canada with her sister in the early 1920s. Jean's older brother had left Scotland for the United States more than a decade earlier to seek work as a coal miner. When the First World War broke out in 1914, however, he went north to Canada so he could enlist with the army. After the armistice, Jean's brother returned to Canada and began a job at Ford, where he quickly befriended another employee that had emigrated from Scotland named Jack Hart. Encouraged by the happiness and success her brother had found on the other side of the Atlantic, Jean, along with her mother and sister, decided to join him in Canada. Their ship arrived at the cusp of summer in 1925, and the women donned heavy, full-length fur coats to disembark - having heard rumors that Canada was incredibly cold - much to the delight of those waiting for them at the docks. Jean Findlay found work as a cook for the head of G. L. Steel while her sister was employed as a housekeeper for the head doctor of the Henry Ford Hospital. The girls found a vibrant Scottish community in their new community, and it was at a St. Andrew's Society dance in Detroit that Jean's brother introduced her to his co-worker, Jack Hart. Jean and Jack married in 1930, and Jack moved into his bride's family's home. The couple welcomed Ian, their first son, the following year. After Ian graduated high school, he enrolled at the Detroit Institute of Technology to study drafting. After working as a draftsman for several years in the early- to mid-1950s, Ian found himself laid off. Unable to find other employment in his field, Ian decided to make a career change. He enrolled in night classes at the University of Windsor and studied to be a teacher. It was during that time that he met Janet, a nursing student who had just finished training at Grace Hospital. Ian and Janet married on 1 September 1962. Intent on keeping the Scottish tradition strong in his family, Jack Hart bought his son and daughter-in-law their first membership in the newly-formed Scottish Society of Windsor in 1964. Ian and Janet passed many pleasant evenings at the Scottish club, becoming regular fixtures at social nights and Burns Suppers. Janet had developed an interest in Robert Burns as a child, and her enthusiasm for the Bard only grew as she matured. Her older brother had played the fiddle and her little sister had played the trumpet; not having any musical inclination herself, Janet decided at a young age that she would make Robert Burns her forte. She spent countless hours transcribing his poems and songs with her father, who encouraged her to stick with it when she got frustrated, assuring his daughter that one day she would be glad to have dedicated herself to something so important. He took her to her first Burns Supper at the age of twelve, where she recited thirty-eight impromptu verses for the audience. 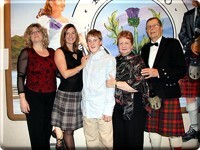 Ian and Janet encouraged their three daughters to participate in Scottish cultural activities as well. 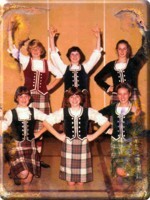 Sheila and Marjorie began Highland dancing lessons as five-year-olds, and Moira began at six. Sheila, sadly, was never able to go as far with her dancing as her sisters did, as she passed away after developing a brain tumor. "She was a great kid, [she] never complained," said Ian in reference to the bravery with which Sheila faced her illness. Given her love of reading and writing, Ian suspected that she would have gone on to university to study English. With a Burns enthusiast for a wife and accomplished Highland dancers for daughters, it was only natural that Ian should also develop some distinctly Scottish hobby. After passing countless evenings listening to the pipes and drums of the Scottish Society Pipe Band, Ian decided to try it out for himself. He learned the basics from Janet's uncle in Ridgetown before taking lessons from a piper at the Scottish Club. With a family and a career as a high school history teacher, however, Ian was too preoccupied to dedicate the amount of time necessary for playing with the Scottish Society's competitive pipe band. But that band eventually folded, and in 1984 Scottish Society President Allan Fullerton decided to revive it as a non-competitive street band. Ian was one of the first people Fullerton contacted to help bring this plan into fruition. Ian was able to dedicate more of his time to piping after retiring in 1994. He had spent the last twenty-three years teaching history classes at the Kingsville District High School, having transferred there after spending three years in Windsor and six years in Leamington. Ian and Janet celebrated the occasion with their first trip to Scotland, having an opportunity to travel there with the pipe band, which was marching in a parade in Edinburgh. Before driving into the romantic Highlands, Ian and Janet stopped in West Calder and Airdrie to see where his parents grew up and to visit friends and cousins. The Harts found themselves back in Scotland the next summer, with Ian and the pipe band playing in the world-famous Edinburgh Tattoo. Although Ian sometimes muses that he's getting too old to stay in the pipe band, he continues with it for his fourteen-year-old grandson, Alec. "[Alec] has a great ear for sound," boasts Ian, who began teaching his grandson to play the pipes over a year ago. Alec now takes lessons from Grade 1 piper Bob Irvine in Windsor and hopes to join his grandfather in the Scottish Society Pipe Band sometime in the near future. Alec's younger brother Aiden has also expressed interest in playing the pipes like his grandfather and brother. At nine years old, however, he is too small to wield the Great Highland Bagpipe, so Ian has started him on the practice chanter, or one pipe from the set. Alec's involvement with the pipe band means that Marjorie Hart-Rochleau is now spending even more of her time at the Scottish Club. Marjorie and her sister Moira have long been regular fixtures at all of the Scottish Society's major events, being two of the area's premier Highland dance teachers. The Hart sisters have been dedicated to this sport since they were young girls, staying involved even after establishing careers and families for themselves. 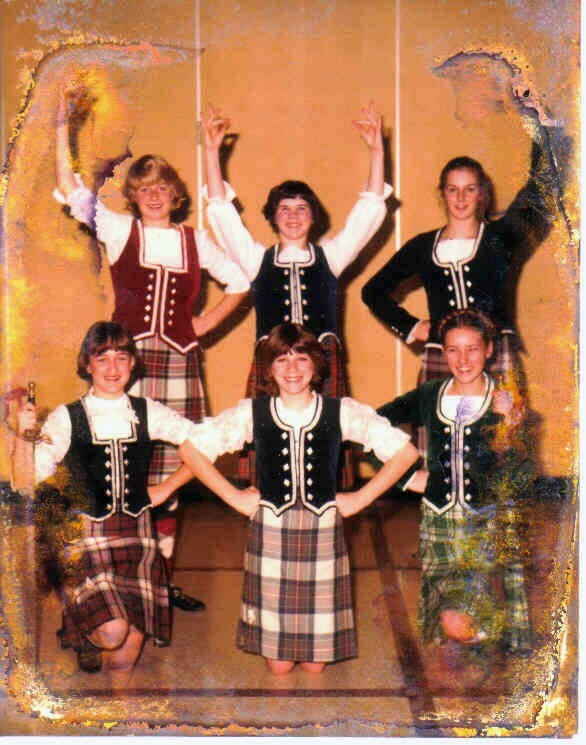 Founders of the Hart School of Highland Dance, Marjorie and Moira's students train at the Scottish Club and perform at functions and events all over the city and county. Their dancers compete in all levels of Highland dance at competitions throughout the United States and Canada. With three generations of Harts representing the family's heritage, it's little wonder that they've become such invaluable fixtures in Windsor's Scottish community.